It’s early morning on Saturday, September 22nd, before dawn. Two long buses are pulled up in the parking lot of Church of the Advent on Franklin Pike in Nashville. A handful of people are standing around the buses. Over the next 20 minutes, the group grows until the numbers reach over 100. Many are holding pillows, carrying backpacks, some have boxes and a few others are holding large glass jars packed with soil. These are pilgrims gathered together for a journey of truth and reconciliation, a journey that for some began generations ago and for others began on this very day. Today, they are traveling together to Montgomery, Alabama, to visit the Equal Justice Initiative’s Legacy Museum & Memorial for Peace and Justice. After a corporate prayer for the journey, the buses are loaded with pilgrims. 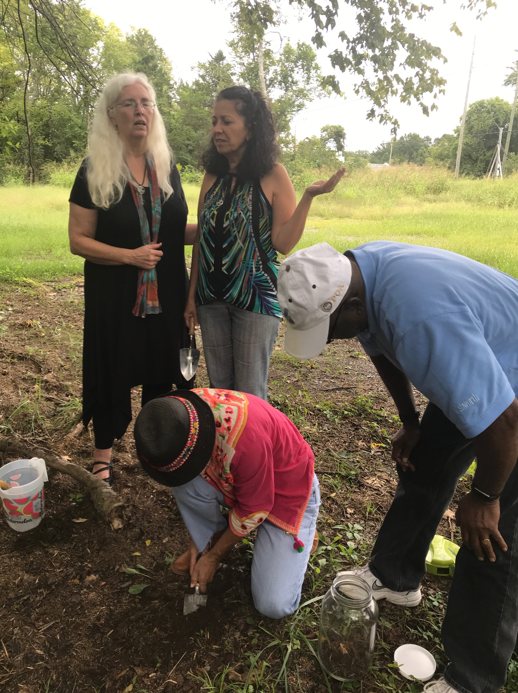 Today’s journey was seeded by the work of The Episcopal Church and the Equal Justice Initiative, but the tribes of the pilgrims are many: they come from various parishes across middle Tennessee, from Fisk University, Vanderbilt University, Tennessee State University Lipscomb University and American Baptist College; they are artists and activists, grandparents, parents and children, ancestors of the lynched, ancestors of the mob, professors, medical doctors, students and justice workers. They travel with open hearts, seeking understanding. The drive to Montgomery is 4 hours long. Many of the pilgrims sleep on the bus. Others read or talk in hushed tones. The sun rises over the South as the bus makes its way toward its destination. It’s 10am in Montgomery, Alabama, the sun is out and the temperature is about 90°F. The buses have arrived at their destination and pilgrims are exiting the buses. The Memorial is perched on a hill overlooking the downtown area; lush green grass surrounds it and it has, from a distance, an airy almost ephemeral appeal. Pilgrims are happy to be off the buses, but the mood is a bit somber, or maybe people are just not fully awake. We’ve all read about what happened and with our ancestors in the south and connections are being made with racial strife that continues to this day, but few of us (if any) have confronted the magnitude of the wound. Much has been written about the architectural features that bring the story of America’s racial history into relief at this memorial. I won’t detail the physical features here and how they work to deal a devastating blow as one passes through inside and outside over the course of over an hour. For each one the experience would be different, and the pure experience is worth the omission here. As a historian of these events, I was tempted to somehow document, though my instincts quickly gave way to appreciation of the emotional effect. The collective experience of pilgrims wandering and reflecting; trading glances, sharing stories and impressions, many keeping to themselves, speaks to the ways in which we have few answers to our shared tragedy. Blue skies call the eyes upward, the hot sun outside beats down on us all equally. Pilgrims flock to the edge of the Alabama river at Riverfront Park for boxed lunch and the temperature sores into the high 90s. There is a relatively small shaded shelter with an insufficient number of tables to hold all of the pilgrims, other tables are exposed to the hot sun. A couple of people experiencing homelessness under the shelter make room for us at the tables and we provide them with lunch and a cold drink. Prayers are spoken and unspoken. Some pilgrims pack into the shade while others prefer spaciousness even in the sun. No speeches are offered, no teachings are given. We experience one another, this day, and an occasional cool breeze off the water. The jars filled with soil that were brought with the pilgrims remain resting on the buses. After lunch, pilgrims tour the EJI museum and visit with one another in the cool spaces of the museum complex. Many gather in the coffee shop and talk together in small groups. These talks are unguided, free flowing reflections. There is a feeling of exhaustion from rising early to catch the bus, from the intense emotions brought on by what we have seen this day, and from the heat. A few of us head out to the buses to retrieve the jars of soil for dedication to the museum. These jars contain the soils collected earlier this month from the sites of 3 lynchings; the lynchings of Henry Grizzard, Ephraim Grizzard and Samuel Smith. By now, we know their stories by heart though their histories were sealed well over 100 years ago. For the hanged and the beaten. For the shot, drowned and burned. For the tortured, tormented, and terrorized. For those abandoned by the rule of law. We will remember. With hope because hopelessness is the enemy of justice. With courage because peace requires bravery. With persistence because justice is a constant struggle. With faith because we shall overcome. Pilgrims gather in a large room at the end of the day to dedicate the jars of soil and to hear from EJI lawyers about the work of creating the museum and the central legal work they provide for death row inmates and in criminal justice reform. The pilgrims have many questions for the lawyers; about the memorial, about the casework, about the American criminal justice system. It is clear that the EJI lawyers gather hope from the community engagement; they respond with clarity, passion and great compassion. The questions and responses go on for so long that the pilgrims must be routed from their seats so that they don’t miss the buses heading first to Birmingham, where dinner is being prepared, then back to Nashville. A group photo is taken just before departure. The mood is elevated as the buses load as pilgrims consider all that they have learned. Some rows of pilgrims begin softly singing spirituals, but not everyone joins in. Some receive the soft sounds in a state of exhaustion. At dinner in Birmingham, deeper bonds are forming and afterwards, business is attended to. There are questions to be considered for churches and prayer warriors, surveys to be completed for organizers, ways to get involved in ongoing justice work back in Nashville to be committed to. The food and fellowship revive the spirits for a while, and chatter is more animated on the buses leaving Montgomery compared to earlier that morning. Buses arrive in Nashville at the church where they started the day in a light rain. The hour is after 11pm when day is done and the pilgrims head back to their homes with news of their journey. “Just hospitality will not make us safe,” Russell says, “but it will lead us to risk joining in the work of mending creation without requiring those who are different to become like us.” I am thankful for the witness of Camp Compasión in providing us with a living image of just hospitality. May each of us go and do likewise. Reclaiming Our Time: Public Theology, Racial Justice and the Fight for Democracy” will be the theme for the inaugural Summer Institute presented by the Vanderbilt Divinity School's Public Theology and Racial Justice Collaborative June 4-8 on campus. Vanderbilt University Divinity School has long styled itself as a School of the Prophets, a Schola Prophetarum. I think this is a marvelously apropos metaphor for a place that seeks to equip people for a still-unfolding world. Prophets are the jazz artists of religion. Priests are like well-rehearsed choirs singing the same music beautifully the same way each performance. The prophets, on the other hand sometimes sing the wailing lament of justice denied. Sometimes they toss off a lighter tune of joy in being alive. Sometimes they sing the blues of how hard it is to persevere in the faith. And sometimes they sing the ecstatic shout of hope achieved. No matter the mood of the religious jazz the prophets sing, they always offer a new song that extends the received tradition so that the word needed now is offered. ‘Make America Great Again’ is nothing but dog whistle politics sounding the battle horn to Make America Hate Again. Walk with me for a moment. Hate is hate is hate is hate is hate is hate is hate is hate, it must be eradicated and called out by all deep Christians and our allies. What happens if the power elites in Washington, DC vote to repeal and replace Obamacare thereby making changes to the Affordable Care Act (ACA) that places my aunt and others like her in jeopardy of losing precious benefits that pay for hospital, skilled nursing facilities, home health, and hospice benefits? I have been trying to understand evil all my life—not the individual acts of sin, but what I call systemic evil like anti-Semitism, classism, racism, sexism and more. Through the years I have come to understand evil as a cultural production.